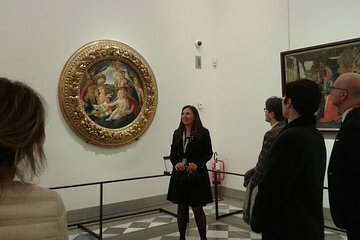 Explore the decorated halls and spectacular artwork in the Uffizi Gallery in Florence with this private 3-hour tour. Take in one of the best collections of Renaissance paintings in the world – including works by Michelangelo, Leonardo, and Botticelli – much of which was commissioned by the Medici. Choose a morning or afternoon tour, and meet your private guide in the Piazza della Signoria near the Uffizi Gallery in Florence. Enjoy skip-the-line access with your guide to avoid the queue. Walk through the ornately-decorated halls and rooms of the Uffizi, once the offices of the Medici government. Admire the famous Botticelli paintings of 'The Birth of Venus' and 'Primavera.' See a colorful painting by Michelangelo, stunning paintings by Leonardo da Vinci, and gorgeous pieces by Raphael. The Uffizi's huge collection focuses primarily on the 12th through the 17th centuries. Enjoy this in-depth private tour of one of the two most-visited museums in Italy (along with the Vatican Museums in Rome).